Better Business Focus is a monthly online business magazine, personalised to your firm with your branding and delivered through your website. It’s a great way to keep in touch with clients, customers and prospects and to help them improve their business performance. Better Business Focus is designed to build your relationships with clients, customers and prospects by giving them regular and useful business insights and performance advice. Supplied in PDF format, you can also print as many copies as you want, or you can email the magazine to your clients and customers. The portal on your website will display, in a page-turning format, the latest edition of Better Business Focus as well as a comprehensive archive of back issues. Better Business Focus is a true differentiator: it underlines your credentials and brings new business to your firm. Better Business Focus is a comprehensive knowledge resource which will make sure your website works hard for your firm. hassle of having to produce your own magazine. You’ll save valuable time and money and free up staff for other important work, whilst providing a valuable resource to your clients and customers. We’re very sure that you’ll gain real value from Better Business Focus. That’s why we have the confidence to guarantee it. We’re so confident that you and your clients and customers will be inspired by Better Business Focus that we’re offering a 30 Day Money-Back Guarantee. If, within 30 days from the start of your subscription, you tell us that Better Business Focus is not for you, we’ll refund your full subscription, with no questions asked. 1. Access available to your customers and clients is provided via your own website with extensive personalisation of Better Business Focus at £99 a month or £1069 a year. 2. 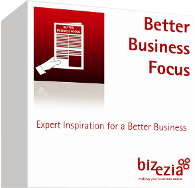 Access available to you only via Bizezia’s website and each edition of Better Business Focus has Bizezia branding at £79 a month or £855 a year.